WE MUST HAVE HUNDREDS EPISODES MORE!!! Producers of this show please hear is all out! This show was AMAZING! Why would you not continue the show?! Great plot and plenty of details were unsaid so you could turn this into a show just as popular as Naruto or Bleach!! You must!! Make more seasons!! Many More!! We love this show! Also there's so much action, romance, and comedy to go around this anime it's the perfect show dot give it up this needs hundreds or episodes!! Awesome series. But 12 episodes is too short, which there were more or in the near future. I really enjoyed watching this series, it was fun and nice. Not very hard to understand everything is right there in front of you, Very straight forward plot. The characters are very lovable. The voice actors are great. 12 episodes seems way short though. Why are there only 12 episodes?! This anime is amazing. I love the characters (personality and design). The concept is really enthralling and is easy to just burn through. Sadly, there are only 12 episodes. I wish there were way more, because this story could go on way longer and never get boring. Definitely recommend this one, but you will be sad and unsatisfied when it is over. Barely passable; a completely unremarkable show. There is nothing worthwhile to say about Dragon Crisis; it is simply a harem anime doing what I would consider the bare minimum to be a watchable show. All the boxes are checked and nothing new or interesting is done. Perhaps they could've put their setting to better use, but since they did not everything is the same old same old. 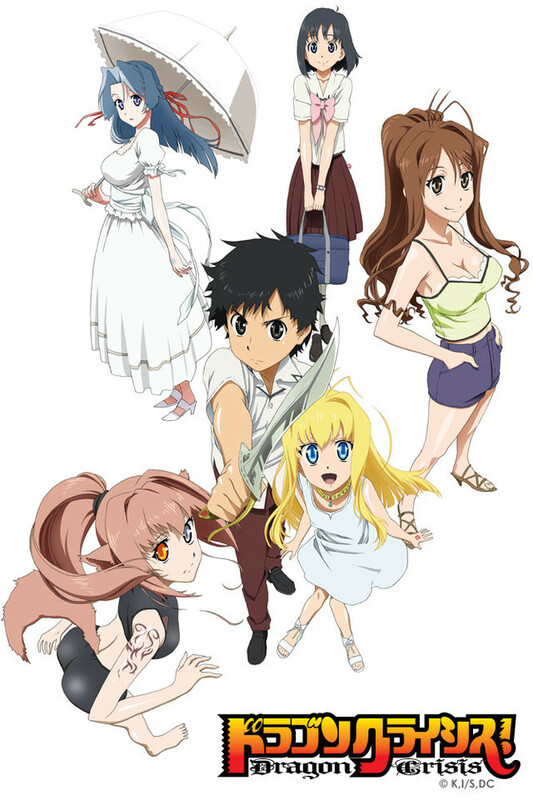 This is one of those anime that falls dead center into "so okay it's average" domain - boy meets girl with supernatural powers and has to work with her and rescue her from trouble, accompanied by several other girls. The series brings nothing new to the table and is easy to forget upon completion, but it isn't necessarily bad either. If you like this genre of anime and want something to watch that won't really make you think, you can do worse than Dragon Crisis. Yup, you'll imagine what's going to happen next, it's quite cookie cutter for all of the scenarios, but some of the characters are quite interesting to balance it off. His school friends are cliche, but the dragons and other assorted characters related to the supernatural are a little more stimulating. The episode follow the standard mold, not a surprise to be had. But really I just don't like the protagonist. He's so drab he disappears amongst the other characters. All the while, being a male marry sue, never doing anything to deserve it but always admired by those around him and being treated heroically. It follows the trend to make a useless protagonist that the heroines inexplicably lust after, probably with the goal of making male viewers feel like they could be the same, getting all the girls without trying, which offends and irritates me, since every single viewer out there is loads more interesting than this guy. It just feels like a case of them treating the viewers like fools. Also, he is apparently one of the few Level 10 (most incredible) breakers in the world, but he's always rather wimpy. The only time he has any strength is when he borrows it from Rose, but he was supposed to be level 10 before that. That and he only has one attack/method for solving problems, really it just lacks creativity. They're always telling you that he is incredible, but never once did I witness that, except when I saw how incredibly gullible he was in the second last episode. If you've got nothing else to do, this will help you while away the time, just don't expect to feel enriched or emotionally moved after it's over.